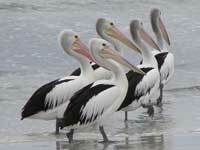 There are roughly 260 species of "water birds" in Australia. 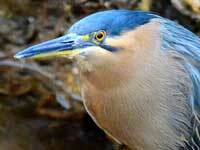 Our definition of "water birds" includes shore birds and waders. This includes migratory birds such as the Artic Tern - which travels from its Arctic breeding grounds to the Antarctic and back again each year. Such birds are "shared" with many countries. His bill will hold more than his beli-can. But I'm damned if I can see how the helican". Found throughout Australia - wherever there is fresh or salt water. 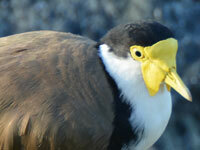 When breeding, their bill goes pink and a yellow patch forms on their chest. Arguably the world's most recognisable bird. 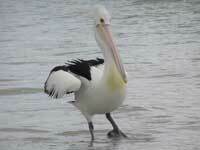 Ungainly on land, but graceful in the air, and efficient in the water. Found mainly in south-eastern Australia, the male Australian Wood Duck has a solid darker-brown head; the female's head is a lighter brown with pale stripes. 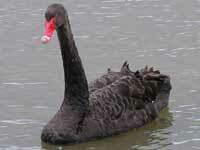 Although the Black Swan is a symbol of Western Australia, it is found throughout the waterways of Australia. Its cygnets (baby swans) are grey - they are shown in the larger image. Stephanie saw this bird inside a building in George St, Sydney - it probably thought the Christmas decorations were very ripe fruit. 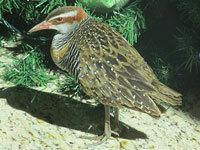 It is found throughout Australia, except in the drier areas and Tasmania. Its hatchlings are sooty black. A very distinctive endemic bird - found in southern Victoria, South Australia and Western Australia - plus parts of Tasmania. The goose in these images was happy to have its picture taken. 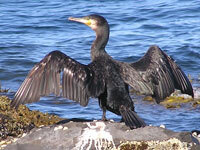 Distinguished from other cormorants by its white cheeks and black neck, it is the largest Australian cormorant. 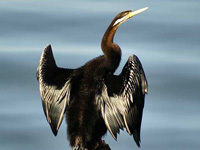 Like the Darter, it is often seen holding its wings out to dry. Here's an image of some juveniles - their blackness is yet to develop. Distinguished from Cormorants by its long pointed beak. The Darter is found throughout Australia - except for the very dry areas. Here's another image. It is found throughout the waterways of Australia. 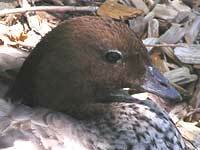 Instead of webbed feet, it has broad flattened toes. 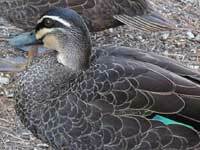 The Pacific Black Duck is mainly found in eastern Australian waterways and the south-west of WA. The male and female are very similar. 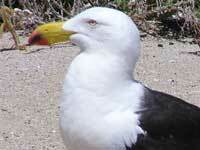 Easily recognised by its red "lipstick", the Pacific Gull is twice as large as the Silver Gull. 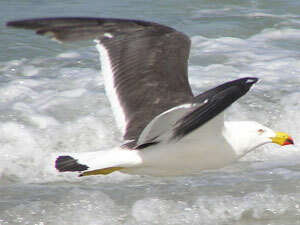 Pacific Gulls are found in large families along the southern coast of Australia. 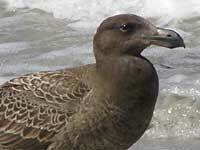 Juvenile Pacific Gulls have dark feathers and legs, and take several years to mature. 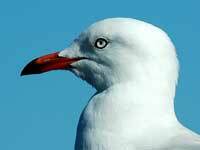 More commonly known in Australia as a seagull. 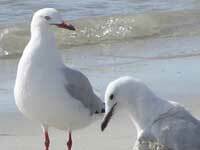 Silver Gulls are found wherever there is water - salt or fresh. They are known as scavengers, but perform a valuable service in this regard. 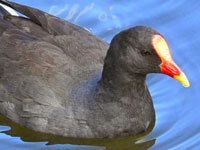 The juvenile has dark legs, eyes and beak. 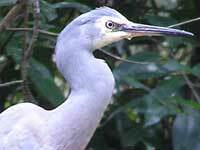 The White-faced Heron is found through most of Australia. 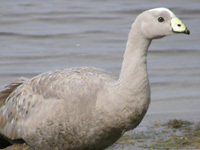 It is characterised by its light grey feathers, white face and yellow legs. Found in swamps and marshes throughout Australia. It has very long toes - as shown in this image. Identified by its large yellow wattle, it is found throughout the eastern and central states. 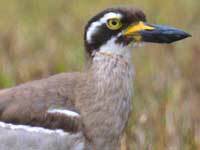 The Striated or Mangrove Heron can be found in mangroves and tidal flats from Eden in NSW around the top-end to Geraldton in WA. 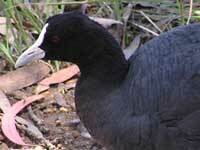 This uncommon shorebird can be found from NSW around the top-end down to Carnarvon in WA. It was formerly known as "Beach Thick Knee". 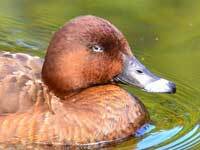 The only Australian pochard or diving duck. 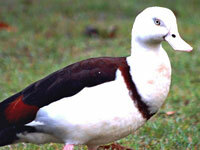 Also known as the White-eyed Duck, it's found throughout Australia except for the WA/SA border region. Found in fresh water locations throughout Australia; its red "fontal shield" helps identify it. 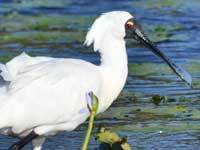 This very distinctive bird with its "spoonbill" and yellow above its eyes can be found in wetlands throughout Australia. Its brown chest band identifies this duck. 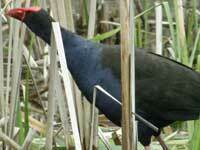 It can be found in coastal wetlands and rivers in the Northern Territory and Queensland.